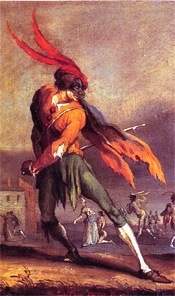 Featured above is Maurice Sand‘s depiction of Pantalone. Maurice Sand was the son of French writer George Sand (1 July 1804 – 8 June 1876), and of the baron Dudevant. 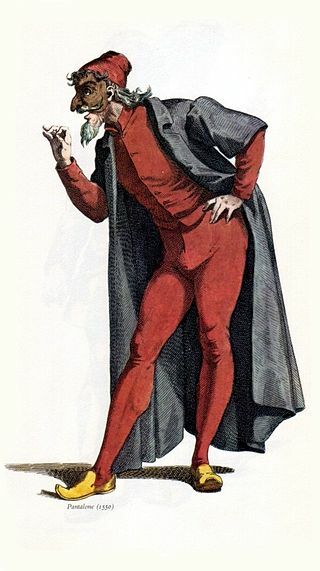 Pantalone is one of the stock characters of the commedia dell’arte, an “improvised” form of theatrical performance originating in 16th-century Italy, or what is now Italy. He is an alazôn, one of the characters who oppose the marriage of the innamorati, the young lovers. With the assistance of very astute and entertaining servants, called zanni, the innamorati fool Pantalone. The plot is therefore consistent with that of comedies. The young lovers overcome obstacles to their marriage. So Pantalone and his fellow blocking characters share the same function, or role, but the role may be played by another actor or mask. In other words, Pantalone, or Pantaloon, wears a mask and is a mask. The commedia dell’arte is akin to the masquerades of carnivals,[ii] except that it is not associated with a season. Pantalone’s role, his mask, his function, is the same from performance to performance, but there are other blocking characters whose personality is different. Pantalone is dressed as Pantalone and his costume is part of his mask. It is always the same and he looks like a hunchback. However, he is not Victor Hugo’s Hunchback of Notre-Dame (1831). He is a hunchback because of the bag of money he conceals. Pantalone is lustful, jealous, deceitful, selfish, lazy, full of himself (“Il Magnifico”), but, above all, greedy. Yet he is Pantalone “di bisognosi” (besoin, the needy). Other than his hunch, Pantalone wears a red cap, red tights, yellow Turkish[ii] slippers, a short vest and a long coat. Pantalone has his own way of walking: hips forward, and he sometimes requires assistance from other actors as he tends to fumble. He is old, a genuine senex or vecche, a consummate “trickster,” often cruel, but always a loser. The innamorati end up marrying. He does not have a wife, but he and Il Dottore may be the guardian of a young woman. As noted above, Pantalone’s function as blocking character, or alazôn, can be filled by another alazôn. The most prominent are Il Dottore and Il Capitano. The dottore is a pedant sometimes called Gratiano. He is not necessarily a physician. He may be a professor or a lawyer, but, whoever he is, he makes grammatical errors or otherwise disgraces himself. As for Il Capitano, he is a braggart soldier borrowed from Plautus‘ Miles gloriosus. Although it is improvised, i.e. there is no complete written text, commedia dell’arte borrows from the commedia erudita of ancient Rome: Plautus (c. 254 – 184 BCE) and Terence 195/185–159 BCE). For instance, Il Capitano, a braggart soldier, is Plautus‘ Miles gloriosus. He is a fanfaron and may have other names, but he is always boasting, listing feats that no one could accomplish in three lifetimes. However, contrary to the commedia erudita, the actors of the commedia dell’arte are professionals. As a fanfaron, Il Capitano is all too human and has found his way into many comedies. Interestingly, he can be linked with the mythic Don Juan. He is Tirso de Molina‘s El Burlador de Sevilla y convidado de piedra (The Trickster of Seville and the Stone Guest) (c. 1616 – 1630), Molière’s Dom Juan (1660) and Mozart’s Don Giovanni (1787). Molière’s Dom Juan is a “grand seigneur méchant homme” (a great lord, but a man of evil) who will in the end be hit by a ghost. Dom Juan, however, is less a seducer than he is an accountant. He keeps a catalogue of the women he has seduced: his conquests. Il Capitano is different from Pantalone, but his function is to put obstacles in the way of the young couple. Molière borrowed his Miser (L’Avare; 1668) from Plautus‘ Aulularia. Although Molière’s theatre includes farces and farcical elements, Molière’s miser, Harpagon, is not a farcical figure. 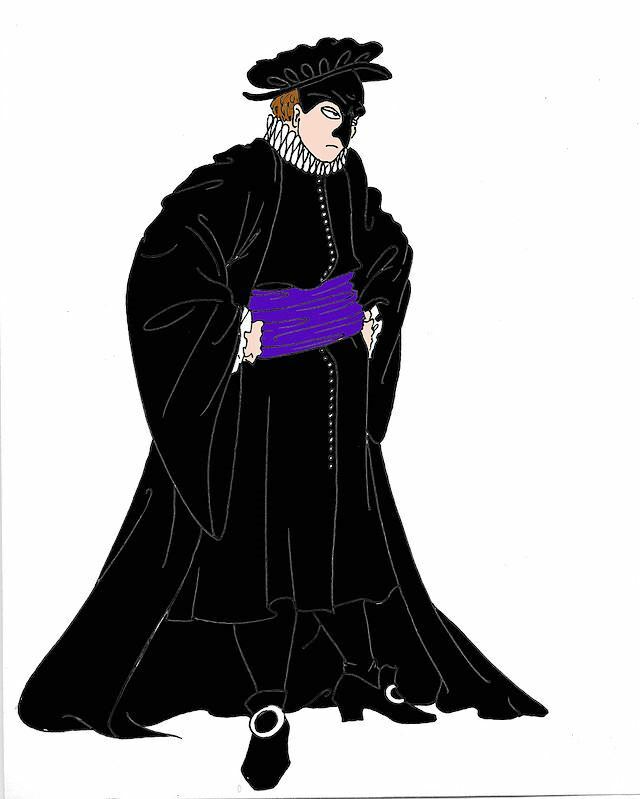 L’Avare is one of Molière’s “grandes comédies.” Molière, however, was extremely fond of the commedia dell’arte. The plot of Molière’s plays is the archetypal the-young-man-fools-the-old-man, or “le blondin berne le barbon.” In other words, the innamorati are always victorious. We have accounts of the commedia dell’arte, but as noted above, no complete text. Molière, on the other hand, wrote his plays, or most of his plays, which does not preclude a degree of improvisation on the part of members of his troupe, or company. I would love to have seen him play Monsieur Jourdain. I will continue discussing the commedia dell’arte, but in short simple posts. [i] Jean-François-Maurice-Arnauld, Baron Dudevant, better known as Maurice Sand. [ii] The Carnival season begins with Epiphany and ends on Mardi-Gras (Shrove Tuesday). It resembles the Roman Saturnalia. [iii] You may recall that Byzantium was conquered by the Ottoman Turks in 1453. Greek scholars fled carrying their books. Their presence in Italy, or Italian city-states, led to the Renaissance. [vi] The second date refers to the year the play was written, or the book, first published. “commedia dell’arte”. Encyclopædia Britannica. Encyclopædia Britannica Online. “commedia erudita”. Encyclopædia Britannica. Encyclopædia Britannica Online. “Capitano”. Encyclopædia Britannica. Encyclopædia Britannica Online. Encyclopædia Britannica Inc., 2014. Web. 20 Jun. 2014 <http://www.britannica.com/EBchected/topic/93989/Capitano>. “Dottore”. Encyclopædia Britannica. Encyclopædia Britannica Online. “Pantaloon”. Encyclopædia Britannica. Encyclopædia Britannica Online.